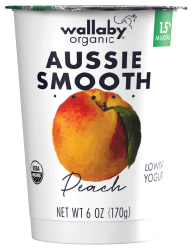 Made in small batches with premium organic ingredients and milk from family farms, there’s nothing else quite like Wallaby Aussie Smooth. It’s creamy, mild and distinctly delicious. With 7g protein and live, active cultures. Explore every flavor. L. ACIDOPHILUS, L. BULGARICUS, S. THERMOPHILUS, BIFIDUS, L. PARACASEI.